We have tried so many combinations of sealants, impregnators and waxes that it isn't funny. And after 3 years of continuous testing, we have found an easy to apply water-based sealant that is superior to every method we have tried before. It comes in a nice satin finish. 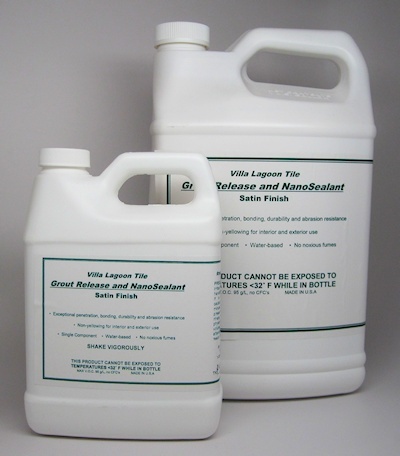 Villa Lagoon Tile is now stocking this product to make it easy for our clients to get the right stuff. It is renewable, so if you ever have any high traffic area of wear-thru, it can be touched up. Our sealant is non-yellowing and seems to be pretty much stain proof. Details of usage can be found in our Installation Instructions. We can ship your sealant with your tile if it is in-stock tile or have it arrive via UPS. We have gallons and quarts. Note: We provide this sealant at relatively low margins to ensure that our clients achieve a lifetime of satisfaction with our cement tiles. We would love to help everyone, but unfortunately we can no longer sell our sealant to customers of other tile makers. While most of our tiles are raw, we have recieved a few lines from our newest production facility which were pre-treated with wax. While this is the norm in many parts of the world, it is incompatible with our NanoSealant for raw tiles, and requires special instructions. You should have been informed before ordering your tile, but if you can't recall or are unsure, we'd be glad to answer any questions about your order. After numerous rounds of testing, sealing and attempting to stain group after group of tiles, we've found that DryTreat Stain-Proof Original works the best for our South Beach collection pre-treated tiles. We also have special instructions that ship with your tile: Installation Instructions (Pre-Treated Tile) that includes applying paste wax after sealing. DryTreat also has a "Where to buy" tool to find local retailers. Warning: Do not let your tile contractor choose your sealant. Most of the time they will sell you the brand they happen to carry (more profit for them so it makes sense, right? ) Usually it is the wrong product. They may genuinely think it is the best choice, and for many of the products they install, it probably is. Cement Tile is a specialty product, and requires a carefully chosen sealant. You do not want to discover that the wrong product was used six months after the fact. In those cases your chances of getting good adhesion with the right sealant are slim. Talk to us about your situation. Depending on the specifics, we can advise you about specialty epoxy sealants for your application. Every cement tile project is unique. Rely on our years of specialized experience to provide a custom recommendation for your project's requirements. We are constantly testing new products and methods for the best balance of cost, durability, and slip resistance.